"Protecting children from school violence and bullying, is not just an ethical imperative or a laudable aim of education policy: it is a question of human rights. Indeed, every child is entitled to quality education in a safe, inclusive and non-violent learning environment. But for countless children, bullying and other forms of violence are often part of a continuum that limits their ability to learn and thrive. Strengthening our strong alliance with governments and policy makers, international organizations, academia, civil society and children themselves we have a unique momentum to translate into action our vision of a violence-free learning environment for all,” said Santos Pais in her keynote address to the Symposium. The International Symposium was organized by UNESCO and the Institute of School Violence Prevention at Ewha Womans University with the support of the Government of the Republic of Korea. The Symposium gathered over 250 participants from all regions, including representatives from governments, international organizations, civil society and academia, as well as young people. The Seoul Symposium aimed to identify concrete actions to implement the strategic recommendations of the UN Secretary-General’s report “Protecting Children from Bullying”. The Secretary-General’s report had been informed by the Study “Ending the torment: tackling bullying from the schoolyard to cyberspace” prepared by the SRSG, which gathered evidence and contributions from leading experts around the world on bullying and cyberbullying. Concerned by this important question, the UN General Assembly called on Member States to raise awareness of children’s right to protection from bullying, to strengthen legislation and put in place comprehensive public policies, to enhance services in schools and communities for prevention and response, and to consolidate data and research on the prevalence and impact of this phenomenon. 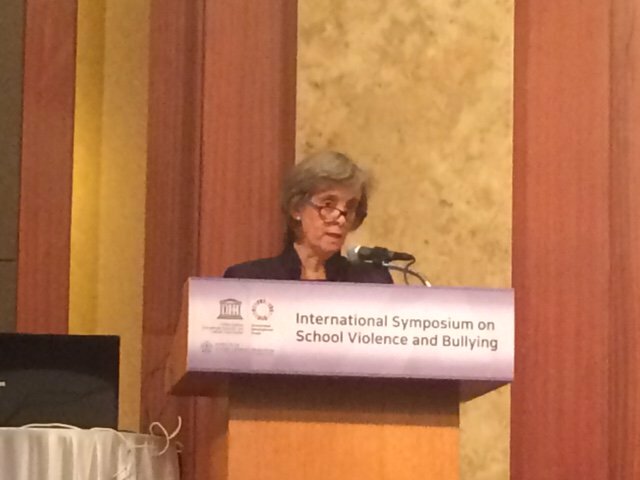 The Symposium was presented with the findings of the “School Violence and Bullying: Global Status Report" prepared by UNESCO and the Institute of School Violence Prevention at Ewha Womans University. According to data from 19 low and middle-income countries analysed in the report, millions of girls and boys suffer school-related violence every year: thirty-four per cent of students aged 11–13 reported being bullied in the previous month, with eight per cent reporting daily bullying.
" The Global Status Report highlights that school-related violence is driven by unequal power dynamics, gender norms and stereotypes and other factors that aggravate children’s marginalization and discrimination. We know how to bring an end to this daily torment suffered by millions of vulnerable children and we need to act now", highlighted SRSG Santos Pais. Recognizing the importance of sound knowledge, data and research, participants at the Symposium agreed to launch a new Platform for data and research on school violence and bullying that will build upon the latest evidence and databases on the prevalence of this phenomenon; will gather information about effective interventions; and promote the development of standardized definitions and methodologies for measurement. "The commitments made at the Seoul Symposium are a major boost to the momentum for an end to school violence and bullying and for the implementation of the recommendations of the General Assembly resolution. And they will help us move increasingly closer to the elimination of all forms of violence against children, as called for the 2030 Agenda on Sustainable Development," Santos Pais stressed in her remarks at the closing session. For additional information, see all documents of the Symposium.